Cancers arise from a cell’s inability to control not only proliferation (increase in cell number) but also growth (macromolecular synthesis). Increasing proliferation without a coinciding increase in cell growth would result in smaller and smaller daughter cells. 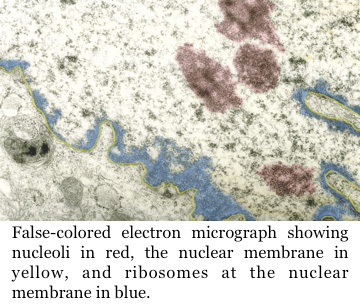 The nucleolus, a subnuclear organelle, is the production site of the cell’s protein synthesis machinery, the ribosome. Historically thought of as a static subnuclear organelle, the nucleolus has recently been shown to be a dynamically important part of the cell governing growth. In addition to producing ribosomes, the nucleolus houses several oncogenes and tumor suppressors, which monitor pro-growth signals within the cell. Mutations in nucleolar proteins as well as the pathways that signal to them can result in tumorignenesis. We are interested in understanding the regulation of nucleolar function and how alteration in nucleolar components can lead to tumorigenesis. Model of t(4,14) mediated repression of ROS by overexpression of ACA11. The projects will examine 3 parts of the model 1) ACA11-snRNP complex formation; 2) ACA11-snRNP complex target recognition; and 3) the mechanism behind effects of ACA11-snRNP-regulated ROS production. The t(4;14) chromosomal translocation found in 20% of multiple myeloma (MM) cases leads to a shorter survival rate in an already incurable disease. The candidate oncogene overexpressed from the t(4;14) translocation, WHSC1 (MMSET), is unable to transform cells in culture or drive tumorigenesis in mice on its own. Examination of a 2 MB region around the t(4;14) breakpoint revealed the overexpression of a 125 bp orphan H/ACA class non-coding RNA, ACA11, which was confirmed to be up-regulated in t(4;14) MM cell lines and patient samples. Further preliminary studies demonstrate ACA11 localizes to the nucleolus as part of a small nuclear ribonucleoprotein (snRNP) complex. In addition, ACA11 overexpression alters the levels of reactive oxygen species (ROS) in response to oxidative stress. We hypothesize that the overexpression of ACA11 in t(4;14) MM reduces ROS-induced cell death leading to the development and/or progression of MM. The ultimate goal of this project is to elucidate the mechanism by which ACA11 exerts its effects on ROS-induced cell cycle inhibition and cell death in t(4;14) MM cell lines. 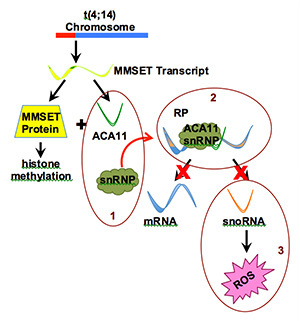 We hypothesize that the overexpression of the ACA11 snoRNA in t(4;14) MM results in the altered splicing of specific RNA transcripts involved in the cellular response to ROS. These selected transcripts will encode either RNAs or proteins critical for B-cell survival in MM. Therefore, ACA11 and its associated snRNP’s will be potential novel targets for MM treatment or diagnosis. Schematic of the Type I Interferon Response regulated by ARF and the point at which small molecule inhibitors may be effective. Cancers arise from the inability of a cell to control growth and proliferation. Within a cell are both oncogenes and tumor suppressors which act like the gas and brake pedals of a car; respectively, controlling growth and proliferation. When a normal cell transforms into a cancer cell, activating mutations of oncogenes and inhibitory mutations of tumor suppressors combine to drive the uncontrolled growth of the cell. However, the specific mechanisms that lead to this uncontrolled growth and proliferation are not well characterized. Therefore, therapies to combat uncontrolled cell growth cannot be selectively directed to effectively block unwanted growth and proliferation. The purpose of this proposal is to understand the mechanism behind the role of the ARF tumor suppressor (brake) in regulating cellular growth and proliferation. The ARF tumor suppressor is the second most mutated gene in human cancer. Previous work has demonstrated that ARF responds to oncogenic signals. Normally present at very low levels in a cell, a pro-growth signal such as that from an activated oncogene like PIK3CA (gas pedal), leads to the rapid increase in ARF protein levels. Increased levels of ARF lead to increased levels of p53 and ultimately inhibition of cellular growth and proliferation. While this canonical liner relationship between ARF and p53 has been established, genetic studies in mice have demonstrated that ARF has functions independent of p53 in regulating cellular growth. Previous work from our laboratory using mouse cells have demonstrated that in the absence of p53, ARF helps to control tumorigenesis through the regulation of an innate immune response. 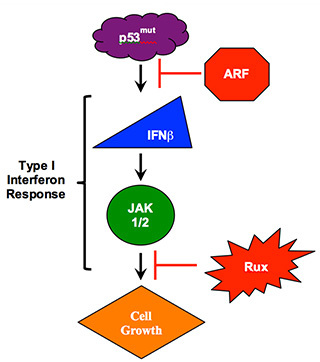 Loss of ARF in a p53-null cell leads to a Type I Interferon (IFN) Response. Classically, a Type I IFN response happens in response to an infection helping to eliminate a pathogen and signal to surrounding cells of an infection. Interestingly, our recent work has shown this same pathway to have pro-growth effects in p53/ARF double-null cells. The goal of this project is to lay the basic scientific foundation for a dual inhibitor therapy for lung cancer patients. Examining The Cancer Genome Atlas (TCGA) Lung Cancer data sets, there are a large number of cases with corresponding ARF and p53 loss. In addition, there are a large number of these cases with amplified PIK3CA. Taken together this data this data suggests that the Type I IFN response (ARF/p53 loss) combined with PIK3CA amplification may drive lung cancer cell growth. This project will use human tissue microarrays and human lung cancer cell lines to determine if the genetic alterations found in the TCGA lung cancer datasets activate a Type I IFN response. We will also determine if inhibiting PIK3CA and the Type I IFN response using a JAK kinase inhibitor will stop lung cancer cell growth.